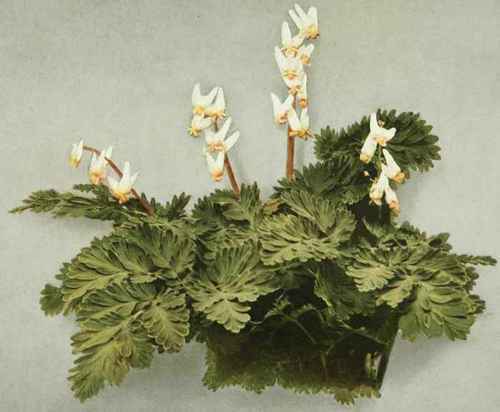 A rather delicate, smooth and somewhat tufted herbaceous plant from a bulbous, perennial base. Leaves all basal, numerous and slender-stalked, pale beneath, finely divided into many narrow segments. Flowers nodding, fragrant, few or several on a slender stalk which rises above the leaves; each flower about one-half to two-thirds of an inch long, and somewhat broader than long across the spreading basal spurs, white or faintly pink, yellow at the summit; the four petals in two pairs, the outer pair oblong, concave, each with a divergent spur at the base and the tip spreading, the inner pair narrow and minutely crested. Fruit an oblong pod, opening into two parts to the base when mature. In rich woods, Nova Scotia to North Carolina, west to Minnesota, Kansas and Missouri. Flowering in April and May. The Squirrel Corn or Turkey Corn (Bicuculla canadensis (Goldie) Millspaugh) is similar, but the spurs of the two outer petals are shorter, rounded and not divergent, the inner pair of petals is conspicuously crested and the roots have numerous small tubers. The Wild Bleeding Heart (Bicuculla eximia (Ker) Millspaugh) of the western part of the State has pink flowers.